Blizzard give their fans another gift celebrating their dungeon sequel’s two-year anniversary. If you played Diablo III over the past week on PC, you’ll have noticed that the drop rate for legendary items and rift fragments was doubled thanks to a special two-year anniversary buff, marking the game’s May 15th launch in 2012. Fragment rates have returned to pre-event levels, but Legendary drops have been permanently doubled. Yay! Well, it appears the promotion was such a success that Blizzard will be raising the drop rate for legendary items permanently, bringing the sequel more in line with the console version’s more charitable nature. Rift fragments however will go back to their drop rate pre-anniversary event, but it’s best not to look a gift horse in the mouth. Watch the new Batmobile in action! Whatever you do, don't call it the Tumbler. WB Games and Rocksteady have released the first gameplay trailer for the highly anticipated new entry in the Batman: Arkham series. 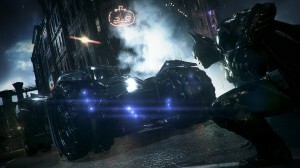 This new footage is all gameplay and features Batman tooling around Gotham both inside and outside of his Batmobile – which players will drive for the first time in by the way – as well as a lengthy appearance by new villain, Arkham Knight who seems to have the Dark Knight in a rather tricky spot. The trailer ends with a ‘coming soon’ moniker rather than the promised 2014 release date for Xbox One, PS4 and PC but we’re guessing all will be explained soon when Arkham Knight takes to the state at E3 in June.